In 1762, a Ryūkyūan tribute ship bound for Satsuma drifted ashore at Ōshima, a small island off the southern tip of Tosa province in today’s Kōchi Prefecture 高知県. From the exchange with a Ryūkyūan named Shiohira Pēchin, the young Confucian scholar Tobe Yoshihiro 戸部良煕 created a comprehensive record. This is called the Ōshima Hikki 大島筆記. At that time the author Tobe inquired in great detail about Ryūkyū, and especially also about China. Moreover there are around 60 ryūka or Ryūkyūan poems recorded in it, including explanations, and also pseudoclassical Japanese-style stories as well as a myriad of other topics from government organization to chitchat. Among karate people the Ōshima Hikki is most famous for its note on the Chinese military officer referred to as “Kūsankū”. Probably because the work has only compariatively limited value within Japanese studies, and because it is an obsolete and difficult language — and generally because most students have different focal points than that –, it has never been translated into English. It appears also never to have been translated into modern Japanese. Illustration of clothes and headgear of Ryūkyūans. Especially among karate researchers this “emphasis on ignorance” is even more astonishing when recognizing the actual value and content of the Ōshima Hikki in terms of Ryūkyūan history, culture, and of course martial arts — the real martial arts of that time. 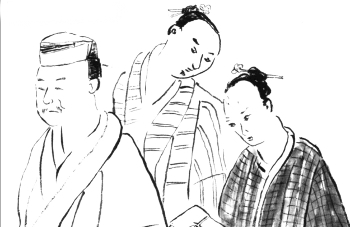 On the right, see an illustration of clothes and headgear of Ryūkyūans from the Ōshima Hikki edition of Kōchi Prefectural Library. For the above reason I start a number of short installments in an attempt to show some of the unique und fascinating contents of the Ōshima Hikki. That is, I will attempt to interpret some of the matters. It used the 1. Kenkadō 蒹葭堂-edition of the Ōshima Hikki from the Cabinet Library (naikaku bunko 内閣文庫), 2. the Ōshima Hikki of the Universität of Hawaii, Hōrei Bunko Yamada-uji (ハワイ大学宝玲文庫・山田氏), 3. Ōshima Hikki der Universität von Hawaii, Hōrei Bunko (ハワイ大学宝玲文庫) and Nishijō Bunko (西荘文庫), and furthermore the – Ōshima Hikki from the Kyōto University Library 京都大学図書館, – Ōshima Hikki from the Kagoshima Prefectural Library 鹿児島県立図書館, and the – Ōshima Hikki from the Kōchi Prefectural Library 高知県立図書館 (Mori Uji Bunko 森氏文庫). ‘Sky’-Volume and the ‘Earth’-Volume of the Hōrei Yamada-uji Hon 宝玲山田氏本「大島筆記」乾 and 「大島筆記」坤. Ōshima Hikki from the Iha Fuyō Bunko 伊波普猷文庫 from the Okinawa Special Collection Digital Archives of the University of the Ryukyus Library. Ōshima Hikki from the Kōchi Prefectural Library 高知県立図書館 (Mori Uji Bunko 森氏文庫). This entry was posted in Ōshima Hikki and tagged Kusanku, oshima hikki, Shiohira Pēchin, Tobe Yoshihiro. Bookmark the permalink.